Once upon a time there was a wonderful land on the north nearby the sea and covered by coniferous forests. The land of freezing winters and shiny warm summers. The land inhabited by minds full of exquisite ideas. The technology paradise named as Finland. And we were invited to this fairytale country. To be more concrete, we were invited to enjoy 2 weeks in Helsinki and Espoo in Aalto University campus. As you know, Defend Your Life! 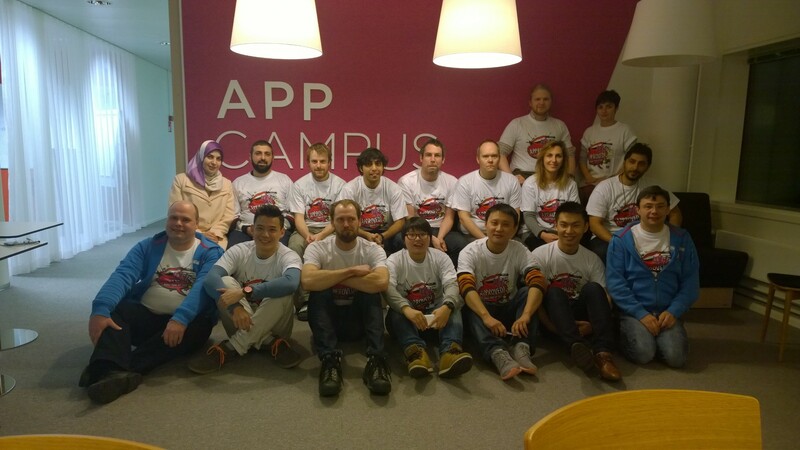 was selected by AppCampus team for supporting and this support wasn´t just about grant. More valuable thing was feedback from testing department of campus during evaluating process, support from AppCampus marketing channels after the release on WP and finally – possibility to attend AppCademy where we got “go-to-market” lessons. You know, everybody would like to improve his/her downloads/revenues/rating/whatever but not everybody is able to fulfill these goals. Pretty simple beginning – all attendees met on Monday morning in order to share the breakfast time together. After the warm welcome and introduction of AppCampus team the work just began. There was nothing to wait for, so here we are let´s pitch! 2 minutes talk and then short feedback, what to improve, what to mention or avoid next time and then trying to answer the most important question (for all 2 weeks not just this particular exercise) – why exactly are we doing what we are doing. Seems pretty simple question but well… is it? Anyway, the pitching was not the only topic of AppCademy. We got useful insights from coaches from various fields – branding, positioning, story development, magic with numbers and statistics a.k.a. analytics, polishing the whole marketing plan and promotion concepts. Each team had opportunity to discuss the topics during one-on-one sessions, too. Some of them were really useful another little bit less. It depended on experience of coaches. But even people out of the gaming industry got great ideas how to deal with promoting the Defend Your Life. One of the most interesting topics from my view were lessons explaining how to work with journalists and how to develop a solid PR communication. Also Thursday of the second week was very special day. Opening session was actually a short panel discussion with two angel investors. Right after that we got the insights into minds of venture capitalists. It was interesting to notice the main difference, which seems that angels are looking for long-term relationship with entrepreneurs while venture seeks serious business with as high return of investments as possible. Of course, both are looking for profit, you know it is still a business, this must be clear from the very beginning. Keep it in mind and you will avoid many misunderstandings and disappointments. Because as I mentioned before it is great that teams actually passed AppCampus strict QA guidelines and get some financial support. 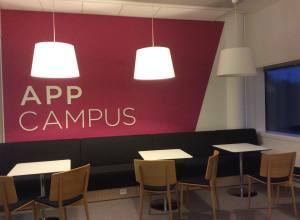 But AppCampus is not about the money. It is about complex support and AppCademy is peak of this. Money come, money go but contacts, if you approach them well will remain. This is what is AppCampus about – gathering the know-how and, using sociological term, social capital. And this is more important and more relevant during the business than just focusing on money. And following the “people” topic I simply cannot forget on around 15 teams attended this AppCademy. Most of them were pitching and presenting gaming projects but we didn´t sense each other as competitors. For two weeks we took roles of colleagues, some of us became friends. Despite the long and tiring days we still were able to find some energy to go out and have a beer… two… three… okay just few of them (I will remember especially the live stream from Microsoft conference about Windows 10 and less remember after party…). And how would I dare to forget the AppCampus team? Just thanks to few people like Paolo for directing the whole AppCampus, to whole QA team (especially Jarno and Weibin) for their patience with our release candidate and face to face feedback, Alina and Timo for marketing support (and photo of the teams), Mika for great Twitter strategy suggestions and introducing us to Czech embassy, Ville for analytics insights and opportunity to eat what he hunted and of course Mike “Sensei” for all his support before, during and after the AppCademy. And warm thanks to any other who helped made these 2 weeks such an awesome. 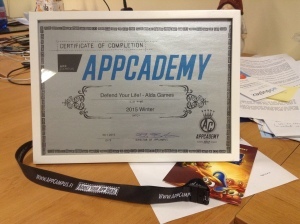 I am aware this was last AppCademy batch and this is reason why we are so proud that Alda Games team was among the selected teams.